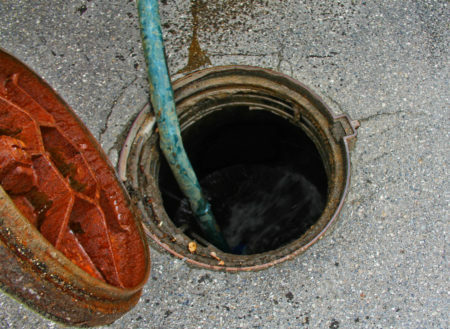 MADAWASKA, Maine — Public Works crews were out Tuesday, flushing the town’s main sewer lines as part of annual maintenance. In September, British engineers tackled an enormous plug of congealed fat and debris clogging London’s sewers, which was an estimated 250 yards long. While Lizotte has not had to address problems of that magnitude, he reminded residents to be careful what they flush down their toilets and sinks. “We find four or five blockages each time,” Lizotte said. Public works crews maintain about 24 miles of main sewer lines within the town limits. They also maintain the storm drain system, which collects rain and snowmelt through the familiar square grates near the curb. The stormwater and sewer systems are separate, Lizotte said. Crews flushed the storm drain lines a few weeks ago, he said. Lizotte said the preventive maintenance also is required by the Maine Department of Environmental Protection. Aside from fall maintenance of sewer and stormwater lines, Lizotte’s public works staffers are preparing plow trucks and other equipment for winter.